I've mentioned before that the surgery Travis will need is called the Norwood-Sano. What the heck is that? Normally, a human heart pumps blood Left Heart -> Body -> Right Heart -> Lungs -> Left Heart, etc. But without a left ventricle, Travis' heart can't work that way. So the doctors will do four things. First, the ductus arteriosus (the DA) - the connection between the Pulmonary Artery (the artery from the right side of the heart) and the Aorta (the artery from the left side of the heart) - is cut. That was what was keeping him alive, but after this surgery it's not needed anymore. All babies are born with the DA open, and it closes usually in the first week after birth. Unfortunately, that was what was keeping Travis alive, so his was being kept artificially open using a drug called prostiglandin. Prostiglandin has other side effects (poor temperature control, discomfort, etc.) and can't be kept up for long. Next, the Aorta - normally the largest artery in the body - is very small for HLHS babies. The doctors cut his undersized aorta off of the heart and cut a slit along its length. They then sew on tissue to make it a much larger artery. 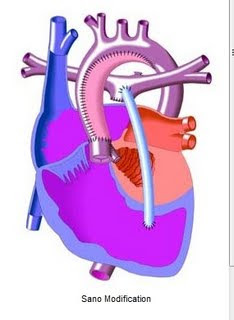 Third, they sever the Pulmonary Artery, sew shut the side opposite the heart, and sew the newly enlarged Aorta onto valve the Pulmonary Artery used to attach to.Finally, they install a gore-tex tube from inside the right ventricle and attach it to the Pulmonary Artery. The picture below (shamelessly lifted from www.pted.org) shows what the heart looks like after the Norwood-Sano is complete. This is what Travis' heart will look like after surgery. That's a big change. But after recovery he will be able to live without prostiglandin, and will be able to get big enough for the next procedure, the Glenn Shunt. In the Glenn shunt they remove the gore-tex tube, sever the Superior Vena Cava, and attach it directly to the pulmonary artery. The picture below - lifted from www.cincinnatichildrens.org - shows the shunt on a HRHS heart. It labels the Superior Vena Cava as "3". The "4" is a Blalock-Taussig Shunt (B-T Shunt) being removed (The Sano Modification is now usually used instead of B-T for HLHS babies). After this surgery, all the blood returning from Travis' head and shoulders will go straight to the lungs without going through the heart. Finally, when Travis is between 2 and 4 years old, the final surgery will extend the Inferior Vena Cava using more gore-tex ("5" in the chart below from www.cincinnatichildrens.org) past the heart to the pulmonary artery. Travis will then have a two-chamber heart, and may not ever need another heart surgery. We hope. I have read it, lived it, and still I don't understand it all. I have tried so hard, but I have finally realized I am just not a medical person. I am glad you posted a more easy-to-read explanation of the surgeries. It is hard enough for those of us that have babies with HLHS to understand, but I find it even harder to try and explain it to someone who doesn't. I am continuing to keep all of you in my thoughts and prayers. No matter what you decide about scheduling the surgery, it will be the best decision for Travis. Hi there. Our son Tyson has Hypoplastic Right Ventricle, as well 3 other heart defects and 2 holes in the heart. He was born Nov. 21, 2008 (when your son was undergoing his first of three OH surgeries, our son was celebrating his first birthday.) He has his Norwood surgery (BT shunt) on Dec. 4, 2008, at 13 days old. His Glen surgery was May 12, 2009 (at 5 1/2 months old) and we are awaiting his Fontan. Tyson is a now 13 month old who is almost 25 pounds, crawling at just before his first birthday, pulling to a stand and cruising around all the furniture. He is now showing an interest in walking but isn't quite there yet! He's doing great after the first two OH surgeries and we can only hope he continues to fight during his Fontan. Keep up the faith, your son will do great! Pictures 11/28/2009 - Hooray for Today!! !